One small business owner is making a big difference in the world of swimwear. Nadia Bailey meets the woman behind Elle Evans Swimwear. From packing our groceries in eco-bags to saying no to plastic straws, most of us are getting savvy on how to cut down our plastic consumption. We get our morning coffee in a reusable cup. We’ve become leery of buying bottled water. We know enough to understand that every year a glut of shopping bags, takeaway cups and plastic drink bottles ends up in the ocean, where it wreaks havoc on marine ecosystems and, by extension, our own. But turning down single-use plastic is only the first step. As environmental awareness grows, businesses are developing innovative ways of giving existing plastic waste new life. Sandman reversible one-piece in Annex Stripe by Elle Evans. Earrings by YCL Jewels. 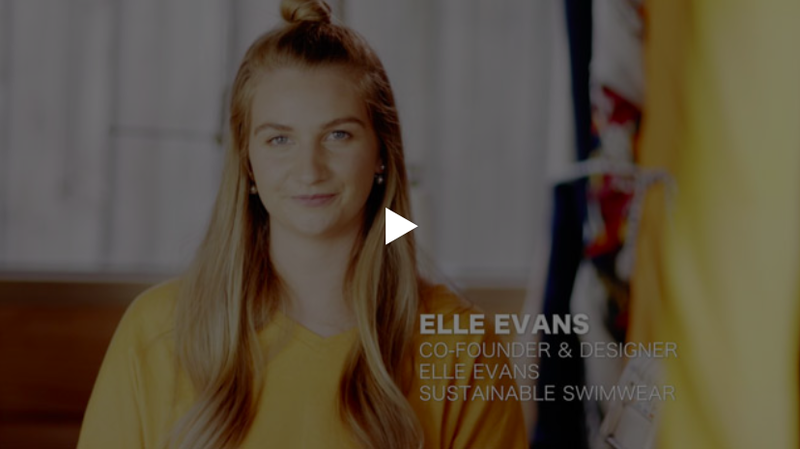 One such business is Elle Evans Swimwear, a Melbourne-based company offering cossies that don’t just look good in the waves, but also improve the ocean’s wellbeing. “Our fabrics come from a mill in Italy,” explains Ellie Evans, the label’s founder and co-owner. “But before it reaches Italy, it comes from everywhere because it’s dredged from the ocean.” The process works like this: marine litter, such as nylon fishing nets and other plastics, is collected from the deep by various organisations (many of them staffed by volunteers) dedicated to cleaning up our oceans and seas. After being cleaned, this marine litter is transported to a plant in in Slovenia, where it’s recycled into nylon yarn called Econyl. This 100 per cent regenerated fibre is then milled into a luxurious, durable fabric in Italy, at which point it’s ready to start its new life as a bikini. Windsor bikini top and Sundowner bikini bottom, both in White, by Elle Evans. Hat by Sylvy Earl. Necklaces by YCL Jewels. Slides by Robert Robert at Zomp. Sandman reversible bikini top and Sundowner bikini bottoms, both in Midnight, by Elle Evans. Denim jacket by Guess. Earrings and long necklace by The Line of Sun. Short necklace by YCL Jewels. By using fabric made from Econyl recycled fibres, Ellie’s business has become a player in what’s known as “the circular economy”. Unlike the traditional model, where raw materials are processed, manufactured into commercial goods, then purchased, used and eventually discarded by consumers, the circular economy hinges on reuse – waste is minimised by breaking down products at the end of their life cycle and transforming them into new products, so the cycle can begin again without introducing new materials. By opting to use this regenerated nylon fabric, Ellie’s company keeps this cycle of reuse going, which means less plastic in the ocean and a lighter carbon footprint. Sandman reversible one-piece in Sunshine by Elle Evans. Earrings and necklaces by YCL Jewels. Keeping production in house ensures everything is executed ethically and to the highest standards. Rather than mass-producing garments at the start of each season, Ellie sews each piece only when a customer places an order. This ensures there’s no excess production and so nothing ends up in landfill. This season’s collection is full of nostalgic colours and prints (bright primrose yellow, a retro stripe) that evoke a sunny, 1970s vibe steeped in classic Australiana. It’s a range that’s full of optimism – and given the label’s planet-friendly credentials, it feels like optimism well earned.